Orkney, not quite the most northerly spot for UK GP training but close. A short flight from Inverness or 2.5-hour drive to Scrabster and then a ferry across to the picturesque fishing village of Stromness on ‘mainland’ Orkney. Whether GP training or holidaying, as we were, what a fantastic and friendly place. So much to see, do and enjoy. A well organised archipelago of islands, we received daily updates of island activities via email and so missed nothing of the busy islands goings on. 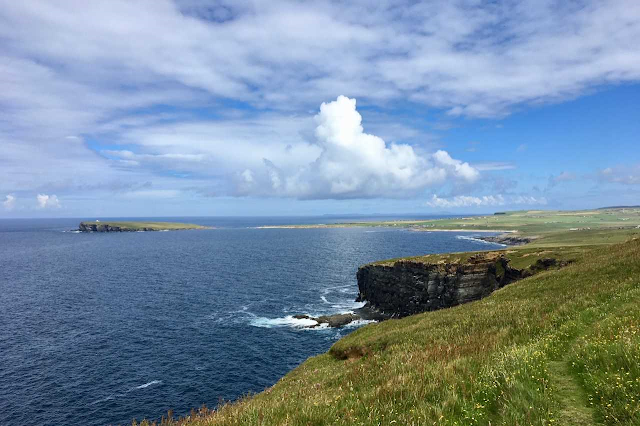 With years of history embedded into the body of Orkney we were tripping over brochs and burial chambers, WW1 & WW2 lookout posts and Viking farmsteads on walks to the beach! Great cycling around the smaller islands with short ferry trips to start the days adventure. We had a great trip round Rousay and visited the digs that are currently excavating Viking ‘patios’ and Pictish villages. Just the week before the handprint of a Pictish coppersmith had been excavated and the excitement of the archaeologists was palpable. Our 3 boys of 11 & twins of 8 were less than excited however by the broken pottery finds but were intrigued by the fish bones sucked by Vikings! Having taken a cottage just north of Ophir we had a fantastic view of the Island of Hoy and were able to cycle around the island leave the car abandoned for most of the holiday. Each evening we were visited by a pair of Hen Harriers displaying their acrobatic hunting in front of the house and gave great delight and competition to the television which like the car was abandoned for the entire holiday. On the one rainy day we visited Kirkwall Parkrun and followed this with a swim at the The Pickaquoy Centre. Fantastic island facilities and what a playground for holiday fun. While on holiday I was drawn to think what a fantastic place to train as a GP. Orkney NHS Trust are currently building a fantastic new hospital due for completion in May 2019 and there are two great training practice The Skerryvore Practice, Kirkwall and The Surgery, Dounby. Orkney NHS Trust also run GP care of the islands with The Orcades Practice consisting of 5 island branch settings. I was tempted to relocate but lost the family vote 4 to 1 with a unanimous consolation vote for a holiday in Orkney next year.